This Sampson Small Cast-Iron Fire Grate - 46020 is one of the many wonderful fire grates we have to offer. Fire grates come in all shapes and sizes to fit the variety of fireplaces and fireplace needs out there. Fire grates in a general sense provide a convenient area to set your firewood on, keeping logs from rolling hazardously out of the fire during burning, and creating a centralized pile of ashes for easier cleanup. Additionally, a good fire grate provides proper air flow both around and underneath firewood to ensure that the fire burns efficiently. Peruse the features and measurements and see if this fire grate is right for your fireplace. After looking around, we're sure you'll agree the Sampson Small Cast-Iron Fire Grate - 46020 is a great fire grate at a great price. what is the weight of this item? This grate weighs 25 pounds. We just received the heavy duty cast iron fireplace grate. It was very easy to assemble and is much better than the grate it replaced. We have a nice warm fire using less wood. It is so wonderful. Would highly recommend. I can't think of any flaws for this product as of yet. Only time will tell, but so far, so good. 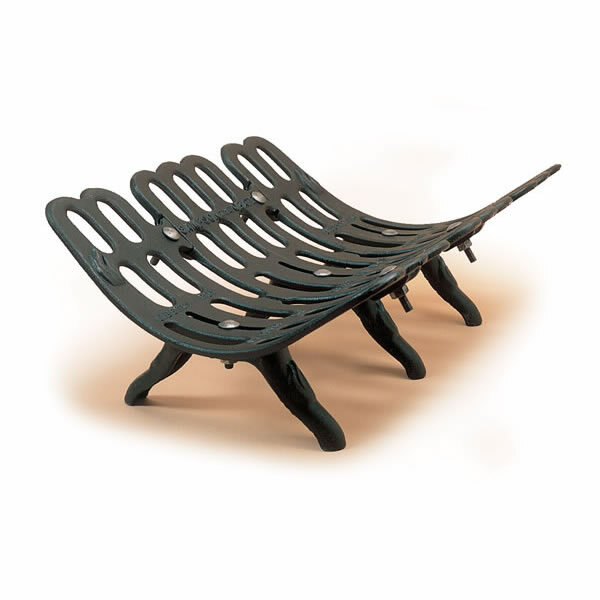 This grate has been carefully designed and works very efficiently for burning wood. It can also fit any fireplace no matter the width. The legs are very supportive, and it should be pretty indestructible even with very hot daily use. I am very impressed with the design of this grate! I highly recommend it!